Set yourself apart from the rest with a new sporty Mercedes Benz Maybach Magic Cars® 600 Class S series ride on car for children with remote control. This exciting electric ride on car for kids also has a parental remote control feature where you can control the movements of the car (some of our customers like to refer to this amazing feature as "mom or dad" mode). Or press a switch in the ride on car and let the driver have full control over the wheel and pedals. Order today and you will receive a working FM radio, opening doors, real rubber tires, FM radio, stereo with mp3 SD card connectivity, and a real leather seat for a limited time! Do not be fooled by imitators, only official Magic Cars® sold on TrendTimes.com come with the Best In Class 1 year bumper to bumper warranty for free! 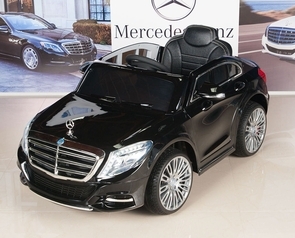 This Mercedes car for kids holds up to 105 pounds and comes with rechargeable battery pack and charger. Watch the official Trend Times Magic Cars® remote control ride on RC car commercial below and enjoy what is so amazing today. Feel good! This Magic Cars® model arrives free with the best in class 1 year bumper to bumper ride on car factory warranty. Deep colored beautiful paint in black, charcoal grey, white, or red will have you in amazement as you gaze upon the detail of this ride on car. Want more? An adjustable seat belt is also included. Now your loved ones can ride around in class and style. Drive forwards, backwards, left, and right all powered by the dual 12 volt motors and 12 volt rechargeable battery pack. Don't be fooled by imitators, only official Magic Cars® sold on TrendTimes.com come with free 1 year bumper to bumper warranty. Have questions feel free to call your free personal shopper at 1-800-350-5420, 24 hours a day.